Last.fm is one of the largest online social music services that enables you to manage, listen, and share your favorite music playlists with your friends and entire community. 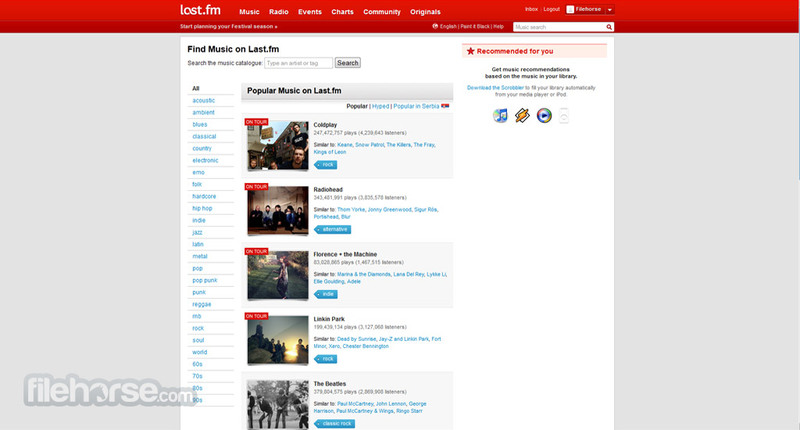 Last.fm was designed to be extremely intuitive and easy-to-use by visitors from all supported platforms (PC, mobile phones, and other internet enabled devices). Amazing Online Music Catalogue! One of the most useful features of Last.fm is their optional 'scrobbler' application that can run silently in the background and collect all your music habits from iTunes, Windows Media Player, Winamp and instantly built your Last.fm library that will follow you whenever you are. That is the power of the cloud. World largest platform for listening online music! Last.fm was created in 2006 to become the largest database of music content in the world, and over the last few years, this service without any doubt managed to become so. By offering its users ability not only to listen music radio station that are perfectly crafted to their tastes, but also the way to interact with dozens of millions of fans and collaborate on building one of the largest user-made wiki systems in the world, Last.fm represents the most complete “package” of music related features that you can access to absolutely free if you live in three best supported countries – US, UK and Germany. 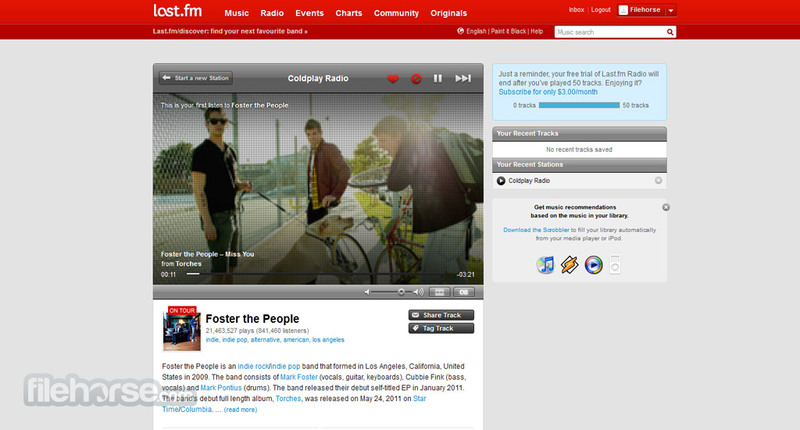 History of modern Last.fm service started in 2006 with the merger of two websites Last.fm (founded in 2002, focused on providing easy access to internet radio) and Audioscribbler (founded in 2005 with goal to enable music uploading, sorting, charting, filtering and playing on multiple PC platforms). When these two services met, radio was integrated into Audioscribbler’s recommendation engine, enabling users to create singular community where music was shared and large Wiki of music database was slowly created. After 2006, Last.fm expanded much of its service outside from US and UK, addend support to the total of 12 international languages. Last.fm is one of the world’s most popular music discovering services that gives everyone chance to enter the world of music like never before. It offers to users one of the best “complete music packages” you can find today, with access to incredibly large catalogue of song, database of songs and preformers, integrated tools for sharing, microblogging, detailed statistics, live streaming and previewing, one of the largest communities, one of the biggest databases of internet radio in the world, and most importantly, industry-leading recommendation engine that will give you the ability to listen radio stations that are crafted to your tastes, mixing both the songs that you like and the songs that you will likely appreciate. Amazing Online Music Catalogue! What separates Last.fm’s music recommendation system from others is that Last.fm collects data about your habits and musical tastes not only from its own service, but also from internet radio stations you listen, your computer music history, data from many portable music devices, and even from the other online music players such as Spotify, Rdio, Amarok and others. This gives Last.fm access to much more precise data about user, enabling them to recommend music on much more higher level than many other services out there. 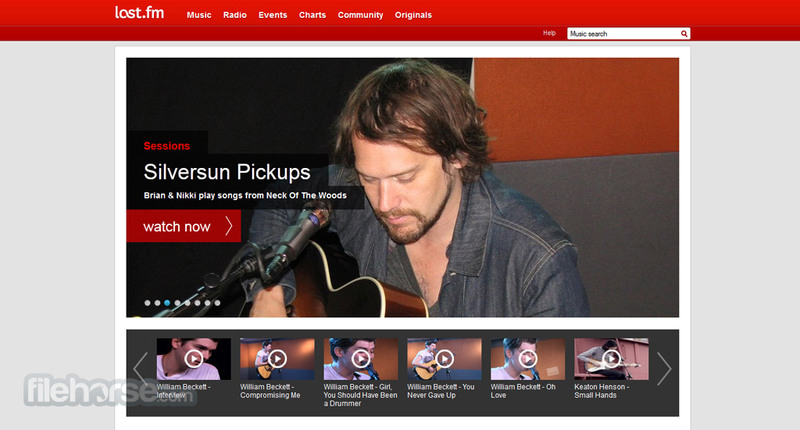 For users inside United States, UK and Germany, Last.fm offers unlimited music streaming even with the free account. Outside from those 3 countries, users can stream only 50 tracks per month before being asked for 3€ monthly subscription. Interface of Last.fm is very easy to use, with website that allows you to easily move through all of its categories. Main page features main navigation bar that you can use not only to search for specific songs or artists, but also to move to main categories of site (Music, Listen, Events, Charts and Originals). Red and white theme is pleasing to the eye, showcased content is presented with very little clutter, and after just few minutes you will be instantly accustomed to its functions. For users from US, UK and Germany, Last.fm is free for use with unlimited listening. Outside of those countries, 3€/month subscription is required, except for people that are content with just 50 songs per month. With over 54 million artists, 200 million albums, and 640 million tracks, Last.fm represents one of the best music services on the market, available via web interface and standalone apps for iOS, Android and many other devices. Amazing Online Music Catalogue! Recommendations based on what you love with a little twist of something different. Never miss another gig. Based on your taste, Last.fm recommends you events and festivals. Get connected with ‘musical neighbours’ - people who love the same music as you.